Located in north-east Paris, the 19th arrondissement is well known for its parks, which are ideal for an enjoyable stroll, such as the Parc des Buttes-Chaumont, the third-largest gardens in Paris, and the Parc de la Villette. This popular residential district is also home to the Grande Halle de la Villette and the Cité des Sciences et de l'Industrie, where exhibitions and events on a variety of themes are presented all year round. You can also find famous concert halls such as the Zénith de Paris and the Cité de la Musique, incorporating the Philharmonie and the Trabendo.Covering an area of 679 hectares, the 19th arrondissement of Paris has the fourth-largest population in the capital. Its postcode is 75019. The district is largely residential, and its inhabitants occupy most of the parking spaces available. What's more, as the summer approaches, the arrondissement's parks and gardens are besieged, making parking a real headache for drivers. For anyone lucky enough to find a space to park in the street, the price can reach €2.40 an hour and parking is limited to two hours. Drivers who exceed this limit have to pay a fine of up to €35. It makes more sense to leave your car in a car park to save time and avoid inconvenience. The Place des Fêtes (75019) car park, located between the Télégraphe and Place des Fêtes metro stations in the 19th arrondissement, is a secure car park guarded 24/7. It offers parking options by the hour or the month, and allows you to take advantage of parking spaces that can be rented all year round. Subscription options are also available for both vehicles and two-wheelers. Fully renovated in 2015 and fitted with latest-generation equipment, the car park offers convenience and peace of mind. 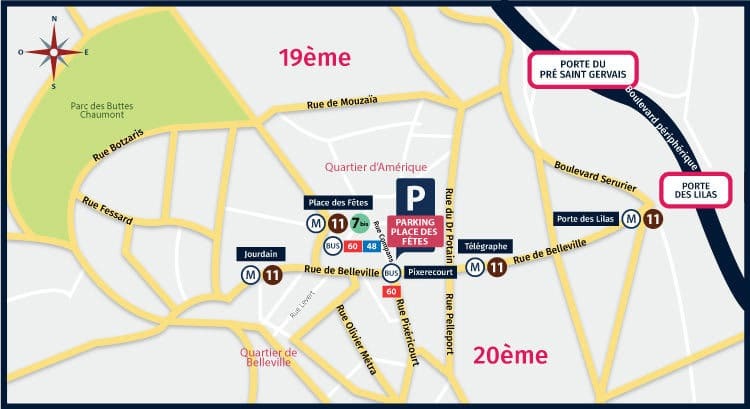 You can also discover our Gambetta car park and our Pyrénées du Clos car park for parking in the 19th arrondissement of Paris and take advantage of our rates and services.